Linn Akurate Kontrol review | What Hi-Fi? OK, so most people are going to use the Linn Akurate Kontrol preamp in an all-Linn system – we did, testing it with an Akurate DS streaming player, the Akurate 2200 power amp and the Akurate 242 speakers. Sitting in the Linn range between the Majilk-I – the company's only integrated amplifier – and the heavyweight Klimax Kontrol, the Akurate Kontrol is a not-so-many-frills stereo preamplifier, with plenty of Linn's proprietary technology under the lid. It doesn't stream, it hasn't got digital inputs, and there aren't even that many controls on display – just mute, volume up/down. input select and sleep. This, says Linn, is an analogue preamp all about 'perfectly preserving every last musical detail and nuance from the highest quality stereo sources'. 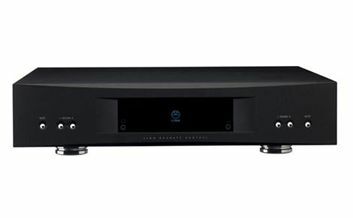 Connectivity is decent, with two line-level inputs on balanced connections, three-pairs of standard line-ins, a single tape out and the option of balanced and single-ended outputs to a power amplifier. There's also a front-panel analogue socket for the connection of a portable music player, and a headphone socket. Oh, and there's an Ethernet socket – but before you get all excited, remember we said the Kontrol doesn't do streaming. Instead this socket is there for system control and set-up, which can be done using the Linn Konfig utility running on a computer. One more thing sets this preamp apart from most of the purist opposition: the inclusion of a switchable – and very good – phono stage for the connection of a turntable. This is factory set as a moving coil input, but can be dealer configured as moving magnet or – should you not have a turntable – converted into an extra line-in. Those who know of Linn’s impressive vinyl heritage won’t be surprised to learn that the Kontrol's phono stage is an absolute corker. It delivers a hefty dose of insight and energy with a capable source – we used Clearaudio Innovation kit to very pleasing effect. The headphone output is equally capable. Usually, such additional circuitry isn’t designed with the same care as the main audio sections and the result is invariably an uninspiring sound. That isn’t the case here: we tried Grado’s SR 80is and Audio Technica’s mighty ATH-W1000X with fine results. However, it's worth noting that the Kontrol is only equipped with a 3.5mm jack, so those with higher-end cans will need an adaptor to cater for the larger 6.3mm connectors. Used with the 2200 power amp and 242 speakers, the Kontrol delivers a sound capable of great refinement, even though the soundstage is less expansive than with some other high-end set-ups, and there’s less sense of depth in the presentation than we expected. It’s the kind of presentation that brings the musicians into your listening room rather than transporting you to the recording venue. A problem? Not for us, though stereo image obsessives might object. In hi-fi terms it's deeply impressive, with high levels of insight, but for all the analysis, punch and precision we could do with a tad more fluidity and exuberance. Used with the rest of the Akurate system, the Kontrol his Linn combination tells you exactly what’s happening, but won’t always stir your soul. However, if you're in the market for a system at this level, and like the sound of that cool approach to music, you should definitely have a listen. We're sure you won’t be disappointed.